Polly the goat does not have it easy; she is a 6-month-old who already suffers from anxiety. She also has neurological issues and is partially blind. However, she has a team of carers at rescue centre Goats Of Anarchy in New Jersey to look after her. A way they have found to calm her down when she is anxious is putting her in her duck costume. Leanne Lauricella, who founded the centre, told BuzzFeed: "As soon as I put the costume on her, she [will] fall asleep. Later, I tried it again and she relaxed and fell asleep again. She added that Polly "loves to be held and cuddled”. 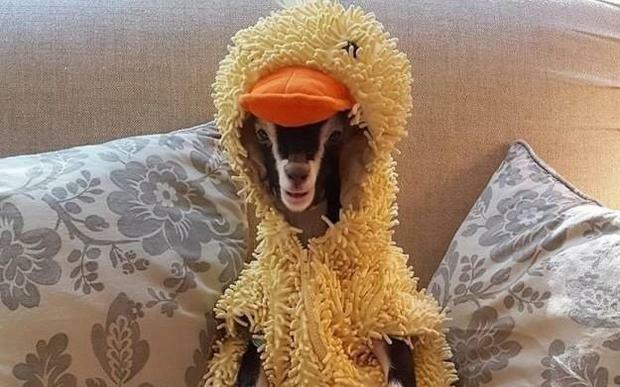 On Instagram, the goat sanctuary explained the goat can use her duck costume as a winter coat, and wear it outside. It will also stop the animal getting anxiety attacks. Ms Lauricella told the website Polly's “strange behaviour has been attributed to neurological problems, but we will be visiting a neurologist in the next couple of weeks for more answers”. She explained it is best for the goat to wear “diapers in the house, and baby onesies to hold the diapers on, so she is used to being clothed”. The goat also loves being swaddled in a blanket, but onesies stay on better. Polly is also in the house all the time, and is dressed up quite frequently too.